Does your pool have an above ground pool heater? Would you like to use your above ground pool year round? It is possible you know. You should start off with a good solar cover. Hook the solar cover up to a solar cover reel for ease of use, otherwise you may not use it. Add a couple of solar panels and you are real close to year round enjoyment. There are gas and electric heaters made for use with above ground pools. When used with solar panels and solar covers they can be very affordable. Hooking up an above ground pool heater will require some plumbing. Pool heaters should be used with PVC pipe, not your standard flexible hose that comes with most pools. Converting your plumbing to PVC is not difficult but will need to be done in order to use one of these heaters. The return flow coming out of the filter goes into the heater. The hot water coming out of the heater goes directly to the return fitting of the pool. Most filter systems are PVC adaptable. Most of the skimmers are also threaded for a 1 1/2" male adapter. The only skimmers I know of that are not are the Doughboy and Lomart. These skimmers need a special hard plumb adapter kit to convert to PVC. These units should sit on a solid concrete base. A concrete pad can be poured or you can purchase a filter slab. Patio pavers work also if you make them nice and level and set them in a little sand. Above ground pool heaters are fueled by either propane, natural gas or electricity. If you choose an electric model be sure you know whether you are getting a 110 or a 220 model. Most are 220 and may require an additional electrical outlet before they can be used. 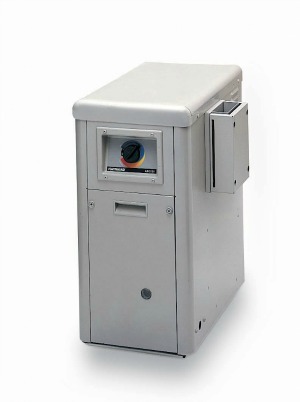 This unit is a natural gas heater by Jandy and sells for about thirteen hundred dollars. 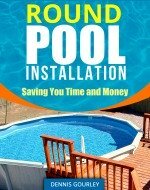 This makes it an affordable option for heating your above ground pool. This is another unit by Jandy that sells for about the same price. 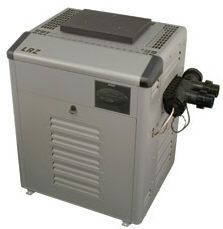 This heater is powered by propane and is another affordable choice for heating your pool. 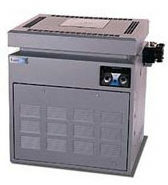 Another alternative for heating swimming pools are the economical heat pump units. In The Swim carries several models of heat pump heaters and can show you how to heat your pool for less expense than what you would pay with conventional heaters.